An artist's illustration of the Russian Express-AM4 telecommunications satellite in Earth orbit. PONTE VEDRA, Fla. — A $300 million Russian telecommunications satellite launched Aug. 18 disappeared from the view of ground controllers and the U.S. space surveillance network along with the rocket upper stage that carried it into orbit, according to industry officials and the Russian space agency, Roscosmos. More than 24 hours after the 5,800-kilogram Express-AM4 satellite separated from the Proton rocket's Breeze-M upper stage, neither object could be found, officials said. The U.S. Space Surveillance Network of ground radars was tracking a single object that one official said was neither the Breeze-M nor the Express-AM4, but rather an auxiliary propellant tank from the Proton rocket. But by mid-day Eastern Daylight Time Aug. 19, the U.S. Space Surveillance Network had located the Express-AM4 satellite, saying it was in an orbit with an apogee of 20,317 kilometers, a perigee of 1,007 kilometers and an inclination relative to the equator of 51.3 degrees. One industry official said it would be difficult, from this position, to maneuver Express-AM4 into operational position in geostationary orbit with sufficient life remaining to make the effort worthwhile. At press time, however, neither Roscosmos nor the Express-AM4 owner, Russian Satellite Communications Co. (RSCC) of Moscow, was in a position to declare the mission a total loss. The possibility remained that the satellite, even in a wrong orbit, could be salvaged and serve at least a portion of its planned 15-year mission. Even a partial solar array deployment would permit Express-AM4 to wait until it received further instructions from ground controllers, assuming it had assumed the standard emergency position of pointing toward the sun. Whether this was the case was unknown. "You're looking at a very large area in which the Breeze-M could have dropped off the satellite," one official said. "Indications are that the Breeze-M was high enough at the time to permit the satellite to survive in orbit and generate solar power, even if its location is not optimal. But there is a real possibility that it would be salvaged, even if its operational life is reduced." Express-AM4, built by Astrium Satellites of Europe with input from Russian industry, is a Eurostar 3000 satellite frame carrying 63 active transponders in Ku-, C-, L- and Ka-band. The two Ka-band transponders will be satellite fleet operator RSCC’s first use of Ka-band for broadband communications links. RSCC is planning a big expansion of its Ka-band capacity with the AM5 and AM6 satellites now under construction by MDA Corp. of Canada. Express-AM4 was launched aboard a Proton-M rocket from Russia's Baikonur Cosmodrome in Kazakhstan. The mission was contracted from Moscow-based Khrunichev State Research and Production Space Center, which is the Proton and Breeze-M prime contractor. Khrunichev-owned International Launch Services (ILS) of Reston, Va., which markets Proton rockets on the commercial market, was not involved in the launch as the RSCC satellite is viewed as part of the Russian federal space program even if it has a largely commercial function. ILS on Aug. 19 issued a statement on behalf of Khrunichev saying in part: "The Proton M launch vehicle performed nominally, and the ascent unit, including the Breeze M upper stage and the spacecraft, separated at the appropriate time. Contact with the Breeze M and [Express-AM4] spacecraft was lost after the fourth burn of the Breeze M upper stage. Roscosmos specialists were able to locate the Breeze-M upper stage. Efforts are now underway to establish contact with the Express-AM4 spacecraft." What the statement does not say is that the Breeze-M's on-board computer guided it to a mistaken, and still unidentified, drop-off point whose apogee, perigee and inclination relative to the equator are unknown. The vehicle was supposed to deliver the Express-AM4 into an orbit with an apogee of 35,786 kilometers and a perigee of 5,210 kilometers, with an inclination of 20.5 degrees. From that location the satellite would use its own power to circularize its orbit into geostationary position about 36,000 kilometers over the equator. ILS said the Russian government has established a board of inquiry, and that ILS, as is its custom in Proton failures, will create its own failure review oversight board. Express-AM4 was insured for $270.5 million, according to two insurance underwriters. RSCC officials said they would have no comment on the Express-AM4 until the satellite’s status was clarified. In addition to RSCC, at least two other satellite operators are likely to be affected by the Breeze-M failure. SES of Luxembourg's QuetzSat-1 satellite, which has been fully leased, is next up on the ILS manifest. The September launch date, which already represents a delay from the original planning, now looks compromised. Each month’s delay deprives SES of guaranteed revenue. ViaSat-1's launch is already several months behind schedule because of two delivery delays. One followed a factory incident in which hydraulic fluid leaked onto the satellite, and the second when all Space Systems/Loral-built satellites, including ViaSat-1, were grounded as Loral verified their solar-array deployment mechanisms. 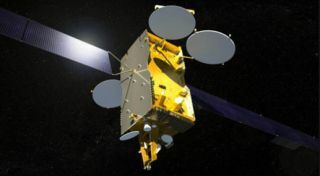 ViaSat’s WildBlue satellite consumer broadband business in the United States has been unable to accept new customers in the regions with highest demand because its current satellite capacity over those regions is saturated.